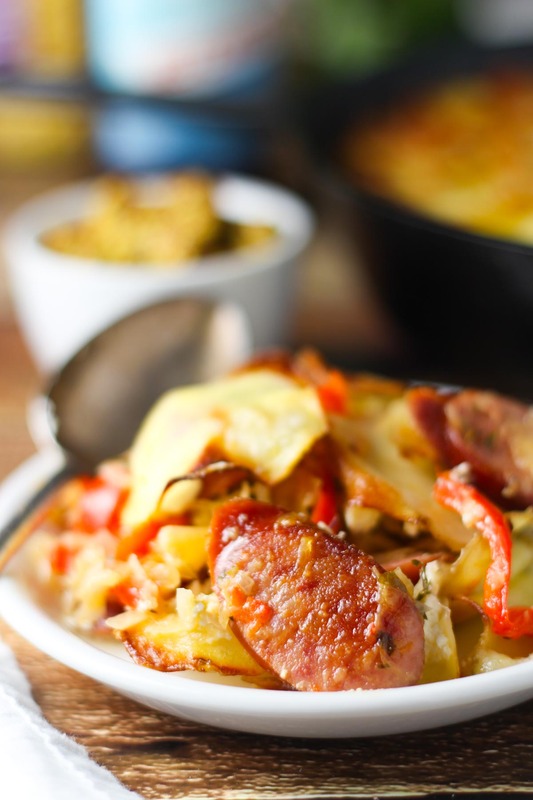 This Sausage and Sauerkraut Skillet Bake, inspired by Oktoberfest, combines two favorites of polska kielbasa sausage and sauerkraut. 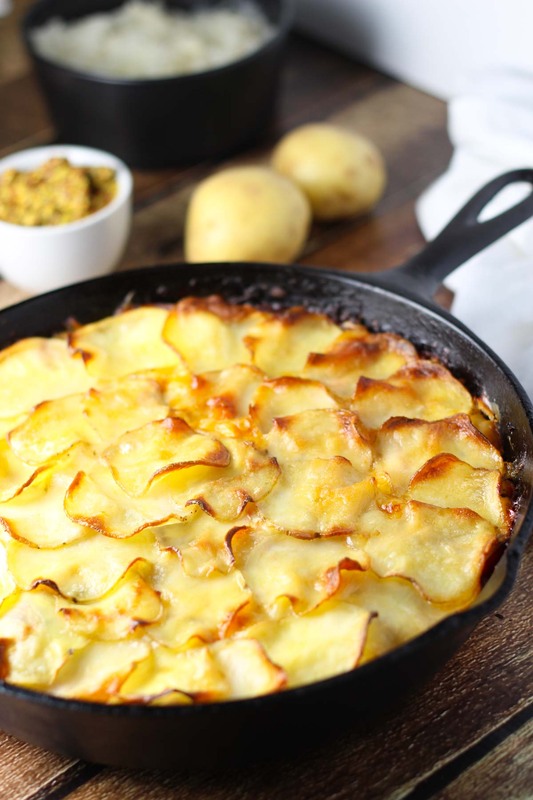 It’s topped with emmentaler cheese and thin potato slices and baked until bubbly. I went on a trip to Germany in high school, and got to see first hand the huge beer halls complete with their massive pretzels, gallon sized beer mugs, and lederhosen. I’ve got a couple of rock-solid memories from that trip. The first was with my mom (who generously volunteered to chaperone the trip). She allowed me to have a beer with her and the rest of the 15-year olds (who of course had permission from their parents as well). Now that I think back on this, it’s very odd. One: Because my mom doesn’t drink and, Two: she really doesn’t drink beer. But the European spirit must have taken over – I think she had a few sips. Second – I got my tongue pierced… Anyone who knows me, knows that this is so out of what one would consider “the norm” for me. I was a quiet, shy, timid 10th grader, from a small town in rural New York. That’s why I did it. I wanted something that no one else in Jamestown, New York had. My mom was shocked. My teachers were shocked. Then everyone started getting tongue piercings. And I took mine out… Let’s just forget that ever happened. So, in the spirit of fall, and with Oktoberfest upon us, I took it upon myself to create a recipe that evokes those memories of lederhosen and massive beers. I grabbed some kielbasa, sauerkraut, emmentaler cheese and potatoes – I was aiming for a bit of a shepherd’s pie mish mash. It worked – It worked really well. You do, however, have to like sauerkraut to be a fan of this recipe. I rinsed the kraut in water, and squeezed it dry, before adding it to the mixture. This helps to cut back a bit on the potent saltiness. It also mellows the flavor a bit. To add some additional flavors to the dish, I sautéed a red pepper along with a shallot and some garlic, dressed it up with some Dijon mustard and wine (just because), stirred in those lovely browned sausage bits, and topped the whole thing off with a layer of sour cream, cheese and thin potato slices. Rick loved this dish. We even ate all of the leftovers on night two, a rarity in our house… PS – It reheats very well. I think I liked the dish even better on night two. What’s your favorite way to celebrate Oktoberfest? 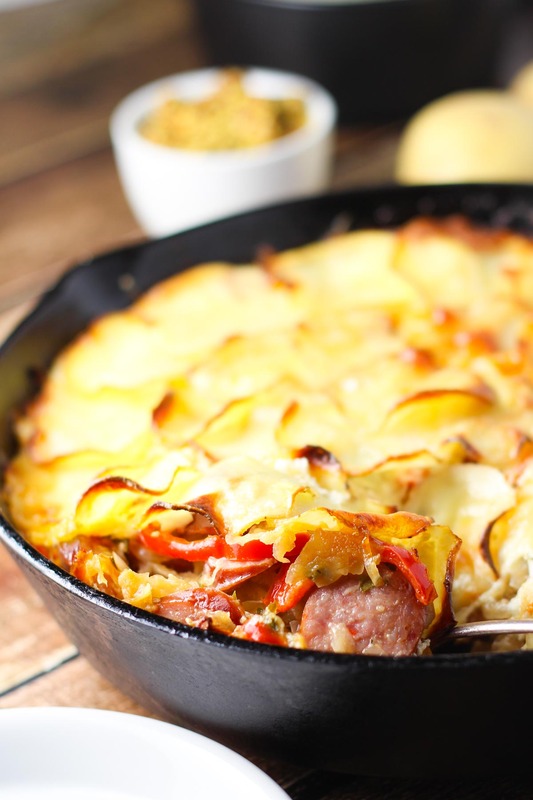 This Oktoberfest inspired dish combines polska kielbasa sausage and sauerkraut, topped with emmentaler cheese and thin potato slices and baked until bubbly. Heat 2 tablespoons oil in a large oven-proof skillet over medium heat. Add the shallot, garlic and red pepper and cook until softened. Add the sliced sausage and sautee until beginning to brown and curling at the edges. Add the sauerkraut, mustard, fennel seeds, cayenne, and black pepper, and stir until heated through, about 4 minutes. Add the wine and parsley and cook for an additional 2 minutes. Spread the sour cream over the skillet mixture and sprinkle with cheese. Toss the potato slices with 1 teaspoon oil, the melted butter and salt. Arrange the seasoned potatoes in a tight formation over the sauerkraut mixture and bake for 40-50 minutes, until the potato slices are browning at the edges and the mixture is bubbling. Let stand 10 minutes before serving. To reheat, bake in a preheated 350 degree oven for 30-45 minutes. This is beautiful! And that is rare for comfort food. Well done! Nice to meet you Candy! We visited PA quite often while I lived there. Especially Erie, PA – For the tax free clothes shopping! Of course Janet – Make this and you’ll definitely be on his good side! Wow! It’s so rare to find people who actually have been to Jamestown Nichole! Small world! Sounds great! I didn’t like sauerkraut really until I tried a homemade version my friend made at her Oktoberfest party last year. Now I’m hooked. And totally agree with the love of giant pretzels at the German beer halls. That basically made me fall in love with Germany! I’ve always wanted to try homemade sauerkraut! Perhaps I’m going to need to cook up a batch soon – The BF loves it! This recipe looks insanely good! I love the flavors, particularly the mustard and kraut. And we all need more recipes that are not only great reheated, but actually better! I’m a huge fan of dishes that can be enjoyed reheated! This was definitely one of those dishes! what a perfect fall recipe. And it looks so pretty too, what a great thing to bring to a wine night with the girls. 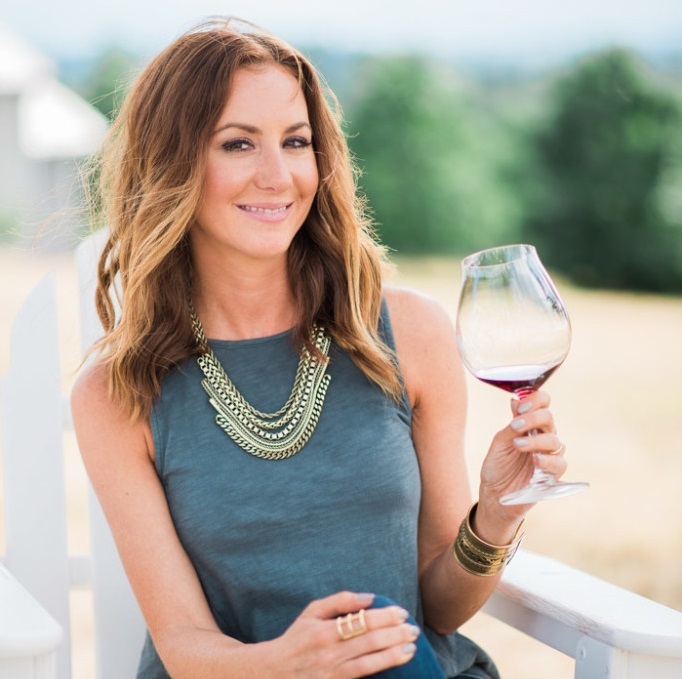 Totally agree Dawne – Wine night and this skillet go hand in hand! We are all about Oktoberfest this time of year! This sounds (and looks!) delicious – I will have to add it to my list of seasonal meals. If you’re a fan of sausage and sauerkraut, I think you’re really going to enjoy this dish Renée! That sounds like a delicious dish Patti – Even with the hotdogs! How can I make this if I don’t have an ovenproof skillet? Hi Nadine! Go ahead and pour the sautéed mixture into a casserole dish, top with the potato slices and bake. Enjoy! could I make this recipe using cheddar cheese?? Hi Bill – You can definitely use any kind of cheese that you enjoy, or have on hand! Enjoy! I just made this and it was awesome. Emmental cheese was a little too pricey at my grocery store so I substituted with Gruyere and it tasted fantastic. I also used Hillshire Farms hot smoked sausage instead of kielbasa because I like it better. Great recipe! Next time I will probably add a little cheese to the top of the potatoes during the last 5 minutes of cooking. So happy to hear that you liked it TR! This worked really well with Beyond Meat’s sausage and half collard greens, half sauerkraut. Divine inspiration. Thank you!